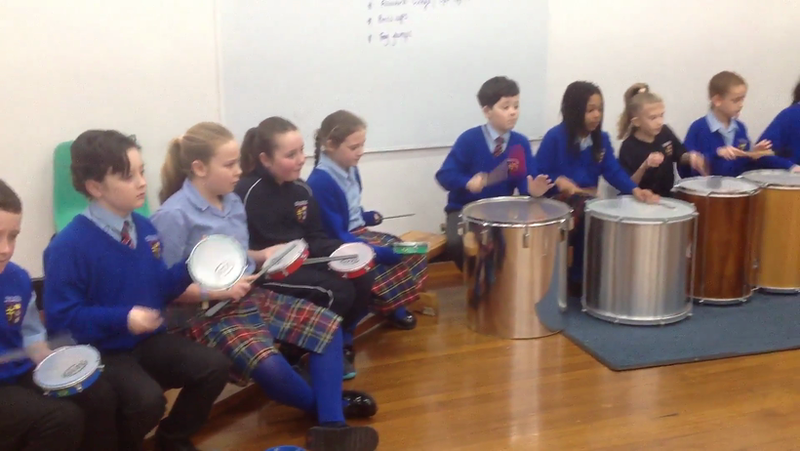 This week the children have amazed us all by showing us their expert drumming skills in . As part of their topic on Brazil, the children have experienced the sights and sounds of the Rio Carnival! Our visitor, who has been teaching children Samba drumming at this school for the past three years, explained and demonstrated the different drums that are popular in the Samba sound. Here is some information about the drums that were used. Surdo: A large bass drum. Four children held the bass notes with this might monster! Tambarin: This is small hand held instrument which is used with the three pronged stick. It is a high pitched sound. It is of African origin. Six children played this instrument. Agogo bell: Two bells attached together. One has a high pitched sound, the other a lower pitch sound. We made the pattern; one, two, three, banana! Again, this is of African origin. Timba: We loved this instrument! It is of Brazilian origin. You must use flat hands to avoid red and sore palms or fingers. There is a low sound in the middle and a higher sound on the outside. Snare drums: These are the glue that hold the sound together. It is of European style. It has a high 'buzzy' sound. These are commonly found in drum kits. The children played a Reggae rhythm which was slower than the rhythms used in previous years but it was, nevertheless, incredibly exciting. Watch out: we may have a future Phil Collins in our midst!